Forecasters are eyeing Tuesday as a day of potential severe weather in the Twin Cities and the region. 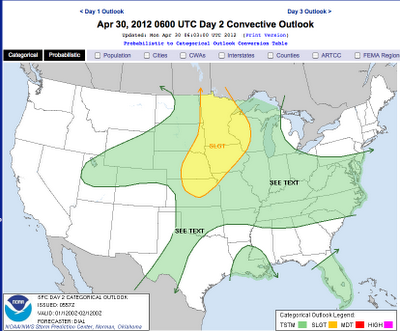 Here's a depiction from the Storm Prediction Center as of the morning of Monday, April 30. Use this thread to discuss your thoughts regarding what may be Minnesota's first significant severe weather of the spring. Last Tuesday, April 17, we took notice of the forecast for yesterday, April 24. Most outlets saw yesterday's "heat" coming, but who came the closest to nailing it from seven days away? With the actual high temp being 73, the best scores go to Weather.com and the Star Tribune weather blog, which forecast 72. KSTP was long by five degrees while Fox was short by seven. As a reminder, KARE doesn't provide extended forecasts beyond five days (unless a weekend is involved; go figure) so they were not part of the competition. The possibility of a few mid-April snow flakes would hardly be noteworthy in any other year, but in this year of March summer it seems so implausible. Here were a few of the weather forecaster comments regarding the possibility of snow next week. 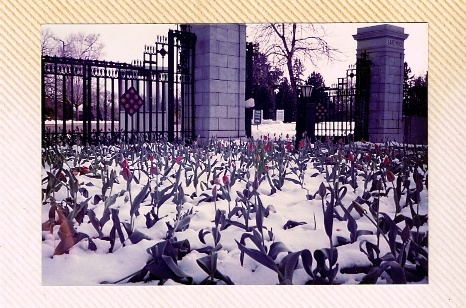 This photo was taken on April 30, 1984 outside Lakewood Cemetery in Minneapolis. So yep, it can happen. While most would agree the weekend forecast was a major bust, if you assess it from the perspective of last Monday's forecast for the weekend, it wasn't quite so bad. 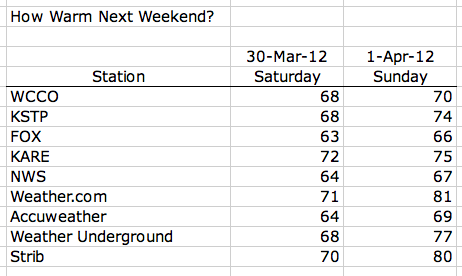 Fox had the closest temp forecast for Saturday (which was still 13 degrees off) while the NWS nailed Sunday's high. If only they'd quit while they were ahead! 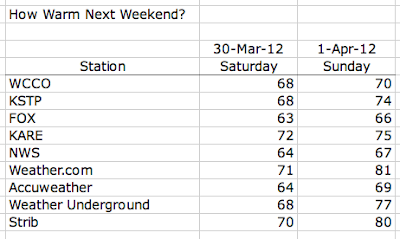 As of Monday evening, forecasters were not in agreement about warmth for the upcoming weekend. 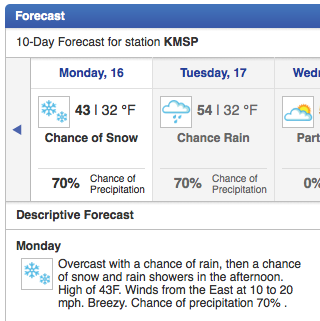 For Saturday, Fox predicted 63, nine degrees cooler than KARE. There was considerable spread for Sunday temps as well. 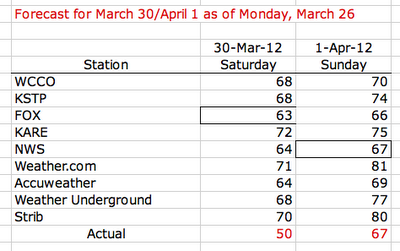 Fox was again the lowest at 66 degrees while KARE was the warmest of the local forecasters at 75. Weather.com forecast a whopping 81 degrees for Sunday.